Cloak Length: about 133cm/52.4". We will try our best to reduce the risk of the custom duties. Size: One size (fits for the height of 165-195cm/65-76.7"). A fabulous and unique full length, pelisse made in a deep rose coloured shantung silk mix. The coat is fully lined in a cotton fabric. The coat fastens with a white frog fastener. they are not like off the peg UK sizes. The fixing of the clasp is achieved from a single shank. A Spencer jacket made from a gorgeous dark cream silk with a 3D dragonfly design. The jacket is half lined in ivory. Fastens with frog fasteners. they are not like off the peg UK sizes. Sleeve 24”. 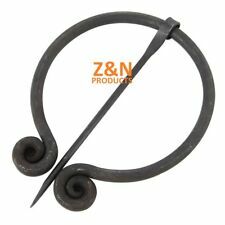 This unique Grand Pennanular Brooch or Cloak Pin has been hand forged and twisted from black steel. This strong brooch can be worn several different ways depending on the style/look you are going for. A Spencer jacket made from a shot raw silk. The jacket is fully lined in pale blue faux habitat silk. Fastens with self-covered buttons. they are not like off the peg UK sizes. A Spencer jacket made from a mulberry wool flannel with purple faux raw silk half lining. The jacket has a waterfall collar with the underside showing the faux silk lining. Fastens with self-covered buttons also in the faux silk. 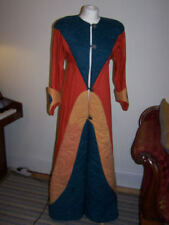 CAPE:- This cape is made from a rust coloured damask type fabric. It is approx 23.5" (60 cm)from the back neck to the bottom. The cape is fastened with two decorative cream frog fastenings ( design of frog may vary due to availability). The coat will be fully lined. A gorgeous cotton twill frock coat from Mrs Papendick Historical Seamstress. Fully lined in black cotton. Stand up, doubled over collar, double breasted with six brass-coloured buttons. Measurements Chest 40” Waist 36” Back length neck to top of tails 17 1/2” Sleeve 23 1/2” Bicep circumference 16” Cuff circumference 12” Not your size? We also offer a made to order service for which we have a listing in our eBay shop. Mrs Papendick Historical Seamstress is also on-line. We offer a no quibble returns policy when the garment is returned in the same condition it left us in. We do not offer costume rental I am afraid. CAPE:- The cape is made from a mixed fibre green and burgundy tartan fabric which has a wool like look and feel to it. Perfect for Dickensian events, also Edwardian. Cape to fit UK sizes 14-18. UK Size 6 8 10 12 14 16 18 20 22 24 26 28 30 32. Stunning Black velvet frock coat. Fully lined with midnight blue. Silver motif decorations. Back has coat tails with button & motif decoration. Will fit up to size 14 ladies. Custom & hand made. A gorgeous turquoise frock coat from Mrs Papendick Historical Seamstress. Fully lined in teal. Back length neck to top of tails 20”. Not your size?. Cuff circumference 12”. A ‘W’ collar navy frock coat from Mrs Papendick Historical Seamstress. The coat is made in soft brushed cotton twill. Fully lined in black cotton. Please The coat is double breasted with six pewter coloured metal buttons with coat of arms. Measurements Chest 38” Waist 32” Back length neck to top of tails 20” Sleeve 24” Bicep circumference 15” Cuff circumference 11 1/2” tails 25” Not your size? We also offer a made to order service for which we have a listing in our eBay shop. Mrs Papendick Historical Seamstress is also on-line. We offer a no quibble returns policy when the garment is returned in the same condition it left us in. We do not offer costume rental I am afraid. This is a personalised service and we are happy to discuss the various options with you. You may also like to take a look at our gallery for further inspiration. Made to order to your exact measurements and specifications. This is a personalised service and we are happy to discuss the various options with you. 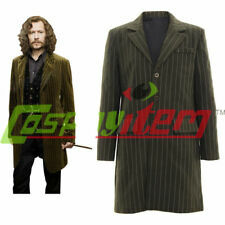 This frock coat will be made of linen, Bengaline, cotton twill or canvas. Please print off one of our measurement charts. We will send you a wide range of fabrics to choose from once you have contacted us regarding your colour preferences. When we have your measurements and your fabric choice your garment shall be delivered to you within four weeks. Please let us know if you need the garment in a hurry BEFORE purchase and we shall endeavour to help. Please note the pictures here are just for reference – they are sold garments. You may also like to take a look at our gallery for further inspiration. 36" FULL LENGTH DOWN CENTER BACK SEAM. 20" SHOULDER POINT TO SHOULDER POINT. 6.1/4" SHOULDER. Yes, we really are that fast! Made to order to your exact measurements and specifications. This is a personalised service and we are happy to discuss the various options with you. Your great coat will be made of wool in a colour of your choice. We will send you a wide range of fabrics to choose from once you have contacted us regarding your colour preferences. Please print off one of our measurement charts. When we have your measurements and your fabric choice your garment shall be sent to you within 3 weeks. Please let us know if you need the garment in a hurry BEFORE purchase and we shall endeavour to help. Please note the pictures here are just for reference – they are sold garments. You may also like to take a look at our gallery for further inspiration. THE BONNET IS A FAUX STRAW, RECONSTRUCTED. VICTORIAN STYLE JACKET. BY MYSELF IN A VICTORIAN STYLE. BRIM AND CROWN, IT IS EDGED WITH A LIGHT. HAT HEAD SIZE. THE JACKET IS MADE WITH A. BLUE BIAS BINDING AND HAS BLUE ROSES ATTACHED TO IT. This is a personalised service and we are happy to discuss the various options with you. Custom made heavy cotton green coat. 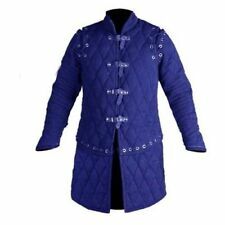 very easy to wash.
Beautiful Museum Quality Handmade Doublet. Also suitable for use as Fancy Dress, Period or Theatre Clothing. 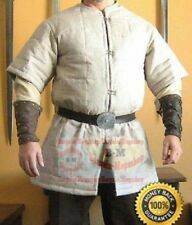 QUIVERSTOCK 15TH CENTURY MEDIEVAL GAMBESON REENACTMENT/ LATE 15TH CENTURY/WOTR. 19TH CENTURY STYLE WOMANS BODICE, LINED WITH BLACK SATIN. COVERED BUTTONS IN SELF FABRIC DOWN CENTER FRONT. PART BONED FOR ADDED SHAPING WILL GO WELL WITH A BELL SHAPED SKIRT. 18 " SHOULDER - SHOULDER. Size 12 (but probably 8-10 modern size). full lined. This is covered in applied roses .. and has a great look .. homemade Will fit a large tall person if need be . Lined in pure cotton sateen fabric. Fabulous original 19th century Victorian ladies silk/cotton velvet jacket. Has a black brown appearance due to velvet being worn. The nap/pile of the velvet has worn in places. 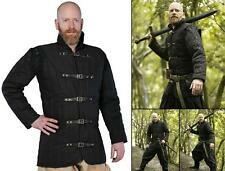 Includes: 1 High Quality Victorian / Edwardian dark navy riding jacket (cotton and polyester). Beautiful form fitting Victorian / Edwardian jacket with classic high collar. We specialize in designing and making historically inspired dresses, gowns and jackets. Ivory Velvet Satin Lined Cloak Hooded Cape Wicca Wedding LARP SCA Ren Faire 50"